In late 1989, as the National Front government set itself up, the walls of power came up alongside. V.P. Singh, with his typical caginess, kept even his closest colleagues on tenterhooks, informing them that they would become ministers only half an hour before they were expected to be sworn in. Some eager ones were said to have already got their bandhgala suits, ones with tight necks, stitched in anticipation. Everyone seemed to be waiting anxiously for an advance indication from the prime minister, but that did not happen. George Sahib nonchalantly went upstairs for an afternoon nap and had no time to change into a fresh kurta when he was woken up and told to reach Rashtrapati Bhavan in twenty minutes. His colleagues and I sat in the office downstairs in his tiny apartment at Hauz Khas, amazed at the lack of dignity in the way this was done. Everyone felt ridiculous. A day or so after the swearing in of the council of ministers, the portfolios were announced. George Fernandes was astounded that he had been allocated the Ministry of Railways. He said he had led the biggest railway strike in Asia and headed railway unions. How could he be sitting across them at the table now? For three days he refused to go to Rail Bhavan to attend office. Finally, V.P. Singh assured him he would change his portfolio after three months. That never happened. George Fernandes went to office in his old diesel Premier Padmini car driven by his Mumbai colleague Freddie D’Sa. The guard at the Ministry’s entrance wouldn’t let him in and told him to get an entrance slip made at the reception first. He hadn’t recognized the new boss who had arrived with no prior information or pomp and splendour. In 1998, the NDA government chose George Fernandes as the convener of the alliance. He had helped draft the Common Agenda for Governance and was considered by the BJP to have given it the legitimacy required to reassure all the dithering ‘are we secular/are we not?’ allies to come on board to give it a clear majority. This alienated many of his socialist colleagues like Madhu Dandavate and Surendra Mohan but even they were divided between the younger and more ambitious ones who stayed because they wanted to pursue an active political life and felt George Fernandes was the best bet to help them achieve it in alliance with the BJP. He always felt happier being among colleagues with a fighting spirit who had a strong nose for electoral politics. Thus he ignored those who were alienated unless they too came occasionally to ask for small personal favours like school and hospital admissions, which he happily facilitated. As mentioned earlier, party workers and even coalition partners constantly asked for favours, from cash to free travel passes to positions on committees that would give their acolytes some clout; there were requests for even getting children who had failed their examinations to be cleared and accepted at interviews. He was always angered or saddened by this, wondering where the fervour to serve without asking for anything in return was disappearing. Most such people nursed grouses against him thereafter, grumbling that if other parties and politicians helped their people, why he could not. It was just not his style to distribute patronage and largesse, since he had never demanded such things for himself. Even while George Fernandes took a lot of flak for his personal insight on Nawaz Sharif, China or even statements in Parliament, and on behalf of the perceived ills of the BJP during NDA-I government, he knew he was still often being used by his colleagues in the BJP without any advantage accruing to him or his Party. As a coalition partner, it was impossible for us to negotiate even one extra seat prior to elections. Even if the Samata Party candidate was stronger and more likely to win, the larger Party in the combine would rather fight and lose than give up the seat to another Party, losing its hold in the future. Coalitions are good for a point of time, but otherwise stifling for individual partners and eventually become a contentious mess if too many small parties are involved, too many disparate agendas and ideologies clash. Ultimately, all they have is the ability to threaten to withdraw support as a bargaining chip. The close rapport between Atal Bihari Vajpayee, L.K. Advani, Jaswant Singh and George Fernandes worked extremely well in matters of handling the Kargil War, or keeping allies on the same page on important policies especially if George Fernandes was sent as a persuasive emissary to bring them on board. They knew he was totally committed to opposing the Congress, and the Samata Party had remained a comfortable ally in Bihar. They respected his political stands on most things. He was always ready to do this as he was determined not to be the cause of a non-Congress government falling this time no matter what he or his colleagues lost as a result. His efforts to keep chief minister and head of the AIADMK, Jayalalithaa, for the short period that she supported the NDA, was hilarious. She threatened to pull out at the slightest pretext and he found himself rushing to Chennai all too often. None was supposed to know of many of these trips as we were all sworn to secrecy. The most crucial one was when it seemed likely she would pull the plug on Prime Minister Vajpayee’s first opportunity to speak from the ramparts of the Red Fort. On the overnight dash to save the day, Sasikala, close aide of the Tamil Nadu chief minister, served Jayalalithaa and George Fernandes an elaborate many-coursed lunch with expensive Baskin Robbin’s ice cream at the end. George Fernandes meekly ate that in the larger interests of government stability much against his ‘swadeshi’ preference for Amul ice cream. Interestingly, his troubles were more within the Samata Party, with many political leaders from Bihar working at cross purposes, and fighting or making up with Nitish Kumar, while George Fernandes had the miserable task of keeping everyone placated and in place. He always said Nitish Kumar was one person whose mind he could never fathom. A democrat before all else, it would be frustrating for him when Nitish Kumar refused to agree upon a date to hold a meeting of the National Executive, or overturned a consensus arrived during such meetings by visiting him alone later at night with his view which he insisted on being implemented. Often, this made the Party lose good people to the BJP; these people who would often spend time having tea with me and sharing their woes about Nitish Kumar. I thought it my duty to convey such matters to George Fernandes, but I knew too that it would inadvertently add to his anxieties. He would always give in to him rationalizing the irrational for the sake of a larger goal. I am sure the tensions he suffered throughout his entire tenure in the Ministry of Defence in matters concerning security, politics of coalitions, the Party, lack of Party funds, and disappointment with issues like Bofors which were not taken to its logical end, added to the neurological ailment building up silently in his brain. 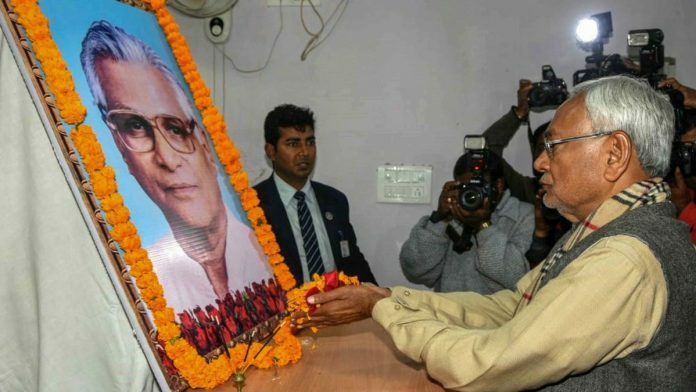 The final nail in the coffin could perhaps have been the humiliation George Fernandes suffered by being rejected as the rightful candidate for his own beloved constituency of Muzaffarpur in a rude and cursory manner by the Party colleagues. By the end, I saw his many frustrations being translated into far too many extended silences. 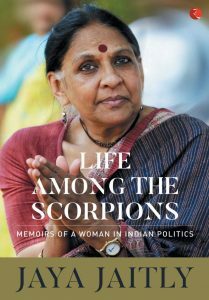 This excerpt was taken with permission from the book ‘Life Among the Scorpions: Memoirs of a Woman in Indian Politics’ by Jaya Jaitly. It was published by Rupa Publications India.